Blanco Beach Bar is with nice rooms and beds with new facilities. It is located right on the main beach and is within walking distance to the town center. Enjoy swimming and tours in the day and great night life on the beach. The restaurant offers local Thai dishes, Italian Pizza, Pasta, Paninis, Salads, Gelato, and Espresso. 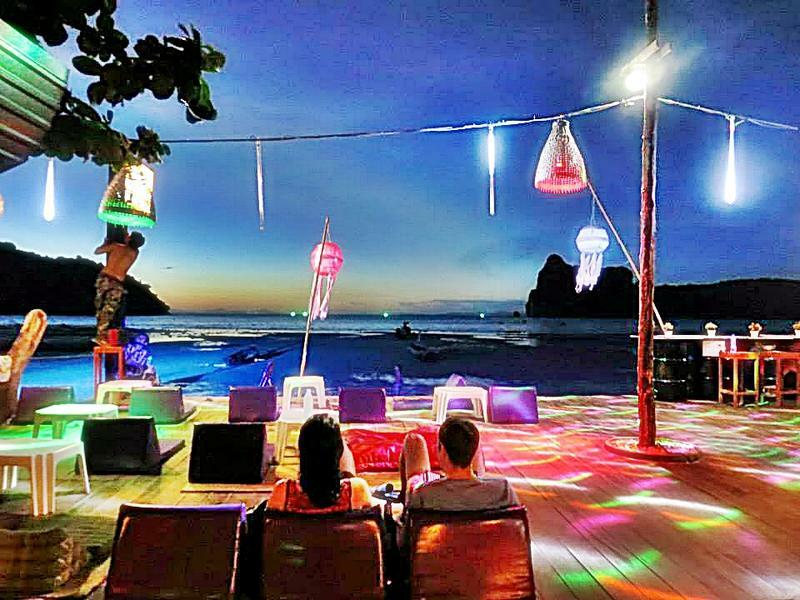 There is a full bar with classic cocktails or refreshing frozen cocktails and Thai fruit shakes. Enjoy sea view terrace and relax with friends on our bean bags for drinks, free WIFI and book exchange. Free fire shows every night are just next door. The hostel offers lockers and 24 hour security. Information about the island for all types of travelers. To get to Koh Phi Phi, you have to take a Ferry boat from the Rassada pier in Phuket Town or from the Chaofa pier in Krabi town. There are also some smaller ferry's from Ao nang beach in Krabi and from Koh Lanta. You will arrive at Tonsai pier in Koh Phi Phi, from the pier walk straight from the pier on to the road straight ahead, walk on the road until you arrive at the beach, this is Loh Dalam Bay. Turn right and walk along the beach until you arrive at Blanco, we are located just after Stones Bar. There are no Cars or Motorbikes on the island so the only option is walking. There are some taxi carts at the pier, who can be hired to carry your bags on a wheeled cart, if you have a large amount of luggage. Also you can stop by skool diver shop just outside the pier on the road to the right. They can provide you with a free map, directions to our location and information about the island and tours.